Basic Information: 16 days riding (average 65 miles per day). Staying at hotels mainly with three hostels. Chris Ellison was the tour leader and drove the support vehicle, whilst I was the riding leader, looking after anyone who needed practical or moral support. In fact everyone coped very well, which combined with the generally dry (if chilly) weather we experienced, gave me an easy time. A great group and a great ride. Here are the details of each day, which could be useful for anyone doing the ride using this route. Arrival Day This consisted of a 20 mile pootle down to Land’s End from Penzance, where everyone met up. After the customary photos, we returned to Penzance YHA for the night. 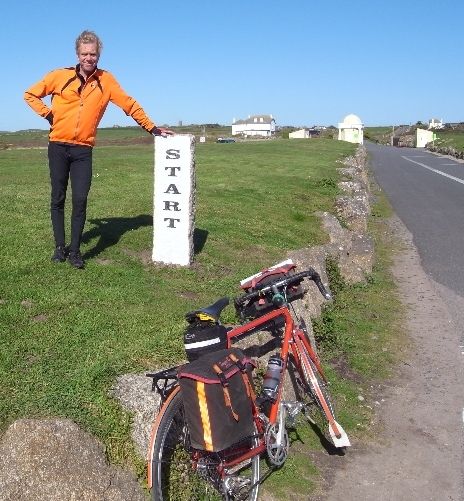 Day 1: Penzance to Lostwithiel (57 miles) Hilly and not much in the way of refreshment stops until the National Trust’s Tresselick Gardens (28 miles), just before the King Harry Ferry, where you need to persuade the man ‘at the door’ that you just want to visit the restaurant. Several pubs / cafés soon after ferry; café at Charlestown, near St Austell. Tricky navigation after Charlestown, then a couple of sizeable hills on very small, grotty lanes just before Lostwithiel. Day 2: Lostwithiel to Exeter (64 miles) Main road bash to start, then slow climb towards Bodmin Moor and Minions (tea shops) – 15 miles. Long descent to Rilla Mill. Lunch in Tavistock (30 miles). Long climb on to Dartmoor. One or two cafés on the moor and in Moretonhampstead, just after. More hills into Exeter or, if deadbeat, downhill almost all the way on the main road. Excellent bike shop in Exeter on the route out (Richards Bikes). A tough day. Day 3: Exeter to Cheddar (62 miles) Over the Blackdown Hills to lunch at the Bell Inn at Broadway. Café for afternoon tea where route crosses A38. Day 4: Cheddar to Hereford (81 miles) Plenty of variety today with two major bridge crossings (on cyclepaths – rivers Avon and Severn). Starts with main road bash along A38. Turn off left is easy to miss. Morning stop at the Kings Arms in Pill, just before first bridge. Cycle path for several miles after bridge. Lunch in Chepstow after second bridge crossing. Climb up to Forest of Dean. 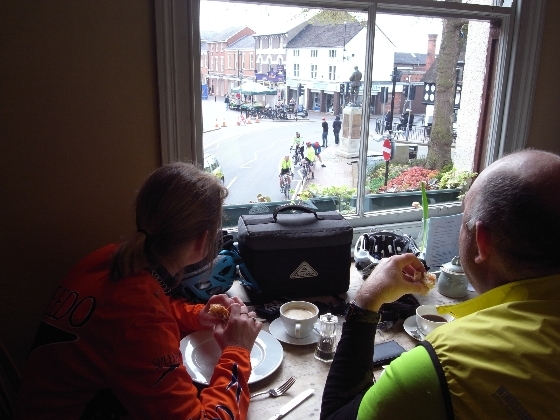 Tea in Ross-on-Wye. Big-ish hill before arrival in Hereford. Day 5: Hereford to Shifnal (64 miles) Cafés in Leominster and Ludlow (12.5 and 24 miles); Much Wenlock (45 miles); Ironbridge (52 miles). You actually cross the world famous bridge. 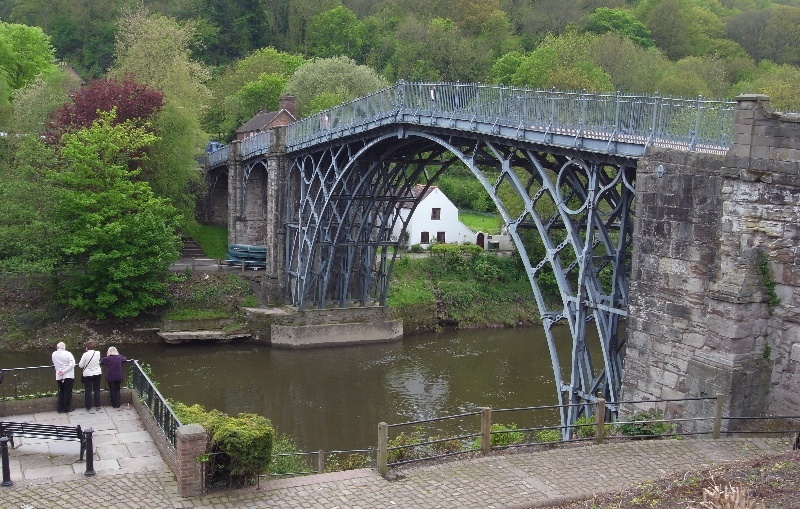 Generally flat-ish day with a bit of a hill after Ironbridge. Day 6: Shifnal to Youlgreave (60 miles) Cafés in Stone (25 miles). Lunch at the Admiral’s House PH (38 miles). Tea stops on Monsal Trail in afternoon. Some big hills today – generally very wearing as you approach the Peak District. The Monsal Trail should be a delight but sadly the tarmac cycle path is very bumpy. Day 7: Youlgreave to Huddersfield (52 miles) Yorkshire Bridge Inn (17 miles), Strines Inn (22 miles), Wagon & Horses Inn (31 miles), Holmefirth (38 miles). Hills through the Peak District including Monsal Head – from the easy side – at start of day and Strines Moor – big hill. The shorter finish passes through Huddersfield with a long drag out of town to the hotel. Alternative route round Huddersfield is recommended, but it’s hilly. Day 8: Huddersfield to Hawes (62 miles) Cafés Haworth (17 miles), cafés on left top end of Main street Skipton (28 miles), pub/cafés Kettlewell (42 miles), The George Inn, Hubberholme (47 miles) – closed when we passed. A big day with two astounding hills to start the day. Lovely countryside is finally reached after Skipton. Quite a busy road between Skipton and Grassington. 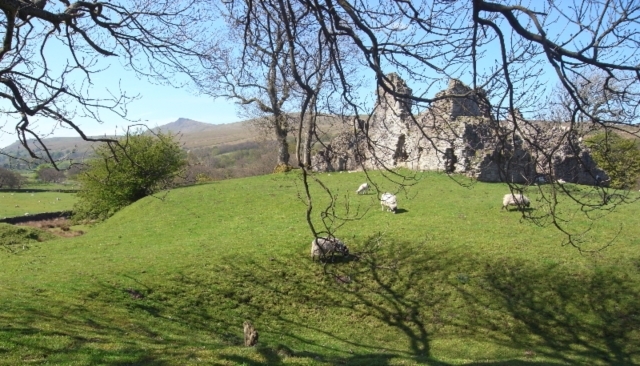 Enter stunning Yorkshire Dales and follow the River Wharfe to climb up over Fleet Moss – a massive big climb before descent to Hawes. Day 9: Hawes to Carlisle (67 miles) Cafés at Kirkby Stephen (17 miles), Appleby (28 miles), Culgaith (36 miles) Wetheral (57 miles); Co-op in Lazonby (40 miles?). A beautiful day’s riding. 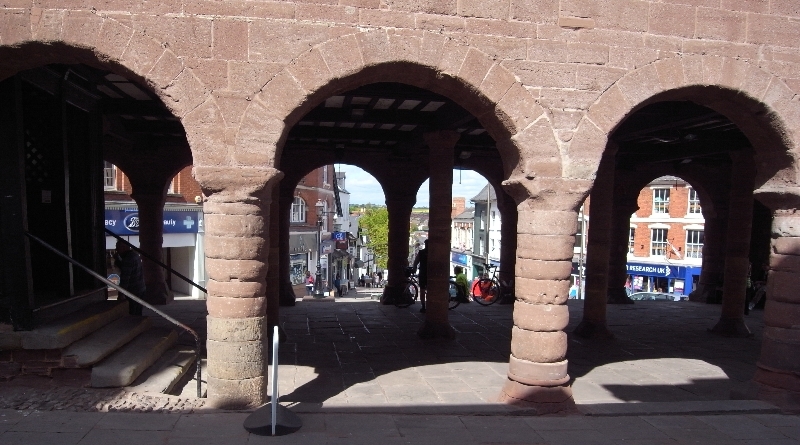 The last section is a long drag into Carlisle, but does avoid the town. Day 10: Carlisle to Abington (56 miles by the direct route; 76 hillier miles via Wanlockhead) Cafés in Lockerbie (23 miles), Beattock (39 miles) on the direct route. The direct route is unspectacular but flat and easy. 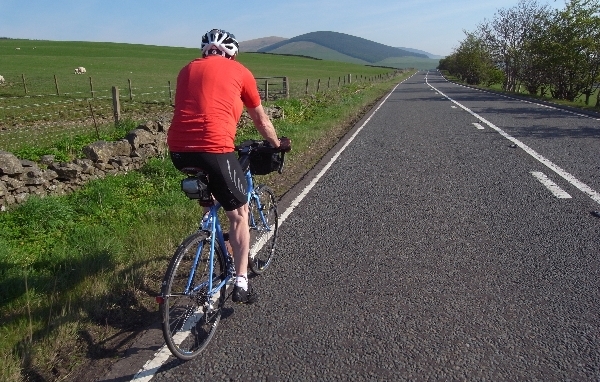 Long straights, wide road, very little traffic, rough road surfaces – they use very large aggregate on Scottish roads. Would recommend the route via Wanlockhead which isn’t too hard despite being longer. Day 11: Abington to Stirling (68 miles) Cafés at Carnwath (16 miles), Forth (25 miles) Shotts (30 miles), Cumbernauld (49 miles). An interesting day but scenically low on the list. Lovely to start and lovely after Cumbernauld. Only significant climb of the day is just before Stirling. Some poor road surfaces. Day 12: Stirling to Pitlochry (61 miles) Cafés in Braco (13 miles), Crieff (23 miles), Aberfeldy (47 miles). Some lovely roads today and again, no big hills other than the one soon after leaving Stirling over the Ochil Hills. 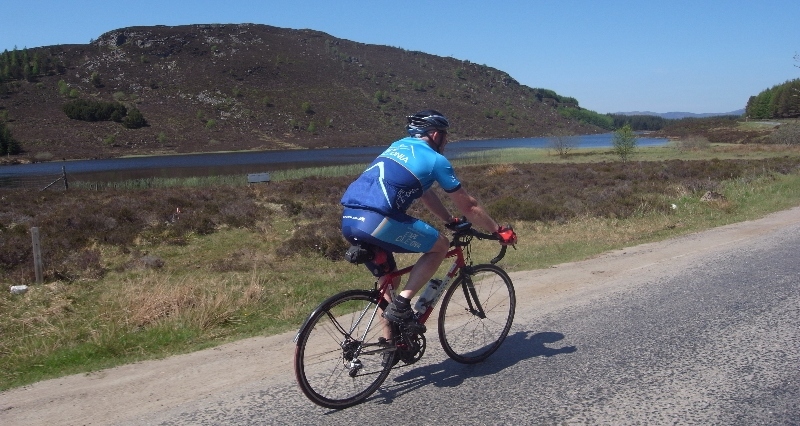 Day 13: Pitlochry to Boat of Garten (67 miles) Garage at Dalwhinnie (31 miles), cafés at Newtonmore (43 miles) and Kingussie (46 miles), Aviemore (60 miles). Over the Drumochter Pass – the highest point of the route and all on cycle path – good surface: better than most Scottish roads. Despite the height the climbing is so gentle you don’t notice it. More stunningly beautiful roads. Began to notice National Cycle Network signs which you follow almost all the way to the end – makes navigation easy. Day 14: Boat of Garten to Tain (67 miles) Cafés in Inverness (30 miles), Dingwall (44 miles), Alness (dist?). Navigating through Inverness is tricky despite NCN signs. Cross impressive Kessock Bridge. Finally reach the far north! Day 15: Tain to Tongue (63 miles) Cafés in Lairg (17 miles, slightly off route to right), the Crask Inn (38 miles), Altnaharra Hotel (48 miles). Once past Lairg it becomes remote and the road rolls on forever – and every inch is stunning. Day 16: Tongue to John o’Groats (63 miles) Not much in the way of cafés but a couple of hotels before Thurso (plenty of choice). Not much between here and Jo’G. Incredibly, the first half of the day is the hilliest in Scotland so it’s a hard final day. The final section involves some long straight lanes which could be described as a little dull, but the proximity to the finish means that you’ll probably not even notice! Once at Jo’G, don’t forget to ride the extra mile or two to the true end of the road at Duncansby Head! You can view the images as a slide show by clicking the appropriate button on the Flickr page. Be prepared to ‘help the show along’ sometimes!